I don’t really remember what occasion first took my sister Judy and me to the skating rink but I know whatever it was we both came home begging to go back. From there it went to begging for group lessons, which quickly led to private lessons and some of my favorite childhood memories. I think I was in 3rd grade when it all started. Sometimes the competitions were far away but sometimes they were at The Stadium, the rink where we skated. It was one of those competitions that led to my worst skating memory. It wasn’t the skating that was the nightmare but what led up to it. Competitions always meant that you had to look your best. Costumes were important but so was your hair. At the time my very straight hair was long and often in a ponytail for practice. For competition, it needed to be curled. My mom would put it in “spongies”. They were pretty comfortable to sleep in but since my hair was so long, I would often wake up with my hair still wet at the ends. 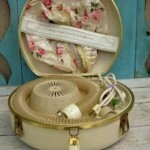 So she got a hairdryer similar to this one only hers was blue and looked more like the old-fashioned carryon luggage. The plan was she would wash my hair, put it in rollers, put the dryer cap on my head and put me to bed for the night. I thought this was going to be a good idea. It was going to solve all the problems – and then it got hot. Really hot! I remember yelling for my mom and her coming in and telling me, “just change positions and it will be fine”. It wasn’t fine it was hot! 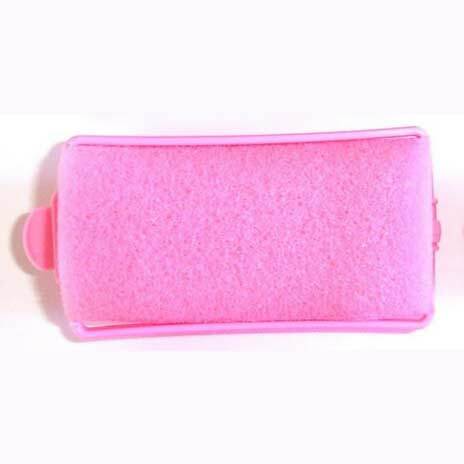 It was so hot that the next morning when she went to take those foam rollers out of my hair she found two of them had melted and she couldn’t get them out! If I hadn’t been so panicked I probably would have said, “I told you so” but you didn’t do that with my mom. She went looking for the shears to cut them out. I was not going to let that happen so I stood there and carefully pulled each strand of hair out of the melted plastic mess. It hurt and I know there were a few tears but I got them both out. I had scalp burns, too that took at least a week to heal and it would hurt to brush my hair. I don’t remember what my hair looked like afterwards but it had to be better than having one side short and the other side long. 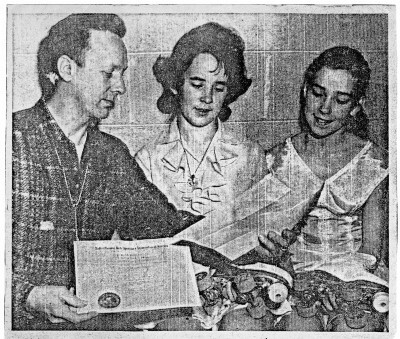 Newspaper clipping of Ernie our instructor with Judy and me. I don’t remember anything else about that day but I do remember being very bitter. She really should have listened to me! This memory was posted in Memories FOR Amara and tagged hair, Kc the child, skating on April 4, 2014 by Grandma Kc. OMG now I know which parent you took after! You might think that but I really do take after my Dad – and his Mom. More about that to come! Hope you’re having a wonderful weekend. Spring break starts Monday so it will be a fun week around here I am sure. Good grief…the days before all the safety warnings on every product! And you didn’t think to take that bonnet off? Very compliant of you! I don’t think it ever even occurred to me to take it off. I learned early not to cross my mother. I was very obedient child. That was a flash from the past! I clearly remember those “spongies” and the bonnet hairdryers : ) Thanks for the laugh! Glad I could make you smile. Here in America you can still buy those silly spongies – although I doubt anyone ever does! Amazing how far we’ve come with hair dryers. Well… my laughter suddenly went to shock with that story! I really cannot believe that your mom would send you to bed with a bonnet hairdryer on your head. In spongies. Yikes! I had one like that too, and long hair — it would take hours to dry my hair in those huge plastic rollers. Glad you didn’t have to cut your hair off, at least! Did you continue with the competitions? And the hairdryer? I am pretty sure I never slept with that thing on my head again but I do remember sitting and reading with it on – a much safer position. As for competitions, I did continue to skate for a while and there will be more stories! Oh, I remember those driers well, only we had very naturally curly hair and rolled our on orange juice cans to get the curl OUT. That sounds awful. did you ever let her put those in your hair again? I do remember letting her put them in my hair again and I even remember her putting that dryer on me again but only while I was sitting up. Oh I remember pin curls, too! I have a picture I should post of my sister and I when we were little and our hair is pin curls and she had tied diapers on our heads! Do you remember spoolies? My hair wouldn’t get dry in those either! I am just so glad that you salvaged your pretty long hair by carefully prying the rollers out. What a nightmare to have gone through. I’m very impressed at your skating skill, though. The fact that your photo was in the paper means that you were probably a much better skater than you let on to us! And I do remember those hair dryers and the curlers, just like the other grandma commenters above! I am probably better than the average Grandma but the newspaper article was really not a big thing. 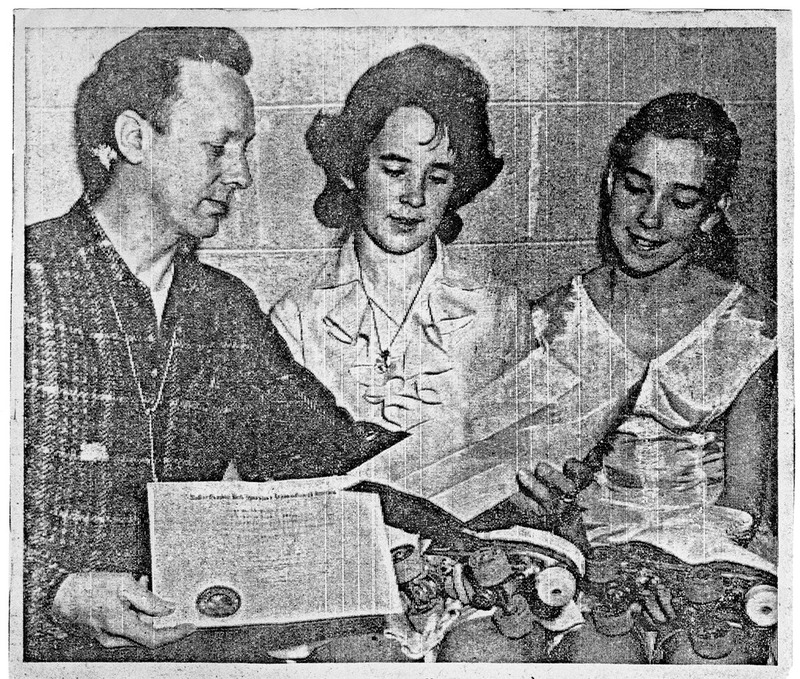 We lived in such a small town that I think everyone got their picture in the paper at some point. I was never a great skater, we really started too old but I did love it and while I seldom skate anymore I still love it. It is like going home. When I first saw the title of your post, I was expecting another story about you and your sister setting the back yard on fire. How frightening to be burned like that. 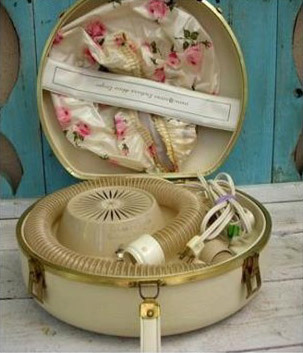 I remember the bonnet hairdryers, too. I knew everyone would jump to the conclusion we had burned something down. Yes! She should have listened to you! What a memory! The newspaper clipping is a treasure. You look adorable. Thanks Lisa, I am glad you liked the picture. I remember that costume well! It was light yellow taffeta with white pearled sequins. I remember those rag rollers! I think I did my own hair in them when I was older. I bet your girls did look cute – especially when all 3 of them had them in. So, your mom is the person who made the manufacturers put the warning label on that reads, “Do not use while sleeping”! LOL LOL You poor thing! That was really a terrible situation. Thankfully you weren’t hurt worse than a bad burn on your scalp! And I’m so glad you didn’t let her cut your hair off! I remember spoolies. I hated them. My hair is really fine and really straight – and no amount of curling makes much difference. I’d wear those crazy looking spoolies and my hair would curl for about an hour. We all go through so much just to look beautiful! I am sure I’m not the only one who has burned their neck or face with a curling iron! You would have thought my mother would have known better! She was an RN. She was supposed to have at least some common sense – yep, she may be the reason for those labels! I should make a list of things my mother should have known not to do! THAT would make a good post! Oh Kc! What an awful night you spent with that dryer cooking your head! In my family, it was my dad you didn’t cross so I know exactly what you mean….if he said do it you did! And I was obedient like you, would never have said no. I didn’t learn to skate as a kid and surely would not try now but I took my kids and always thought it looked wonderfully fun flying around! Love your treasured newspaper clipping! Thank you Connie, I have another newspaper clipping from a few years later that I will get around to sharing. I bet your grandkids would love to go skating and I bet you would have so much fun watching them! My mother and I have bad hair history too. My hair is very straight, thick and heavy which drove my mother crazy. Every Saturday morning she would wash it and put it in either brush rollers or pin curls which I was required to wear until Sunday morning because it took that long to dry. On Sunday morning, when she took the curlers and pins out, it was just one very large poufy mass of frizz. Fortunately, my hair is so straight that it didn’t last long. Usually it was straight again by noon. Big hair was really in during the 80s but not when we were kids! Oh those terrible brush rollers, I’d definitely rather sleep in pin curls. Oh, my! That must have been so painful. I can’t imagine how hot that must have been to melt the curlers. I am surprised it didn’t burn your scalp. It is amazing we survive childhood.